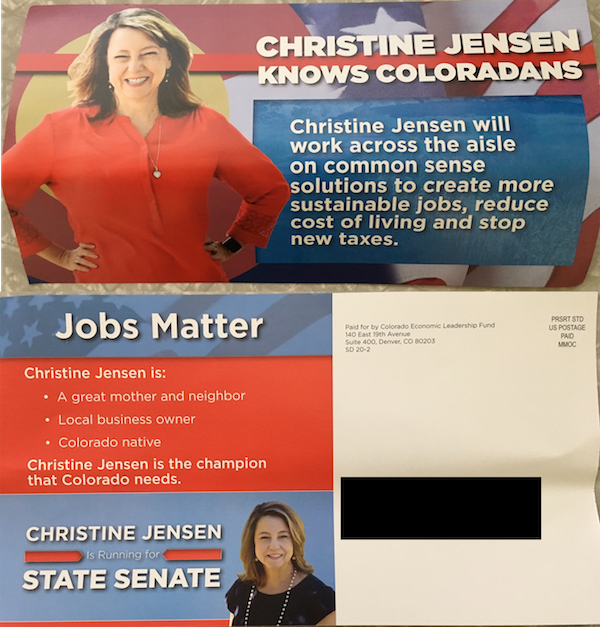 This mailer from nonprofit Colorado Economic Leadership Fund says that Christine Jensen will "work across the aisle," although it doesn't say what office she's running for (Senate District 20 vs. state Rep. Jessie Danielson), what party she belongs to (Republican) or specifically to vote for her (because that would require the group to disclose its spending and donors). The group is also airing cable TV ads praising Jensen. The Colorado Economic Leadership Fund is a nonprofit group formed in 2014. It doesn't have a website, nor is it registered as a political committee with the Secretary of State. In 2016, Anadarko Petroleum donated $510,000 to the group, while Noble Energy gave $25,000. In 2018, the nonprofit donated $200,000 to Fair Maps Colorado, which supports two measures on redistricting; $50,000 to Coloradans for Responsible Reform, which opposed a measure limiting housing growth that didn't make the ballot; and $15,000 to the Business Opportunity Fund, an independent spending committee that supports pro-business candidates.